Just when I get done writing the epitaph for Joe Swift in the last review, here he comes again rising from the ashes like a phoenix, still unable to shed himself of his many flaws yet somehow overcoming them to a degree all the same. If rock ‘n’ roll was handing out accolades for its work to date Joe Swift would win the award for Most Tenacious in a landslide. Hopefully by this point on Spontaneous Lunacy it’s clear that I don’t have a hidden agenda when it comes to championing certain artists. This project wasn’t some elaborate charade meant to promote any eclectic tastes or elevate the stature of any individual names. My goal was always to simply to expose all artists who served in the ranks of rock ‘n’ rollers over its seventy plus years and counting, in the process hopefully shedding some much needed light on each of their stories, exposing their work – good and bad – to those in my generation in the 21st century who never knew of it, and letting everybody decide for themselves what was worth getting excited about and what was somewhat justified in being forgotten. Obviously certain artists are going excel and most often it’ll wind up being the expected roll call of luminaries who are leading the charge. After all they became legends for a reason and that reason boils down to the fact they made consistently better music than their contemporaries. But there’s also quite a few who achieved that same high standard and yet have been largely obscured in the years since, some of whom even struggled for notoriety at the time they were current, either due to lack of a strong record label to promote them, or some fluky set of circumstances that systematically denied them their just rewards. In those cases, yeah, I hope the reviews of their work here can bring them some belated acclaim but I’m not treating them any different going into this endeavor or anything. Everybody stands or falls on their work, as it should be. But there’s a human element to all of this as well. A sense of wanting to see justice done in the case of those who were undeniably skilled yet somehow couldn’t connect with the public, or maybe those who kick-started something important only to see someone else reap the benefits from it down the road, and then there are the ones whose greatest asset was their consistency, a vital and desirable trait in any endeavor yet all too often sadly undervalued in historical reassessments. In those cases, while I won’t give added points as a cumulative career achievement grade or anything, I may find myself rooting for them to knock one out of the park every once in awhile just to make their case for retroactive stardom a little easier. Joe Swift is none of those things, yet maybe feeling some sympathy for him because he’s constantly dealing with the impediment of one honking weakness he possesses (that of a voice which strangely emanates from his perpetually stuffy nose) I find myself hoping that his name and his extremely tenuous place in rock’s early days doesn’t get eternally forgotten. I think in the end it comes down to the fact that with Joe Swift, even with all of his obvious faults, I still end up being surprised to discover that I actually LIKE most of his records. If nothing else it makes him an underdog, an unlikely character to make a claim for any lasting importance, and there’s something to be said for somebody who hangs in there against the odds and carves out a place, however small, that they’re able to call their own. Do You Want To Start Late? Once again Swift’s cause is aided by an interesting arrangement, but unlike his piece de resistance, the mind-blowing That’s Your Last Boogie, here the arrangement has a lot of pieces that shouldn’t really work, at least not to highlight a rock song, yet winds up doing so all the same. One of the recurring themes in rock’s earliest days is the prevalence of jazz roots in rock’s DNA. Though blues and even country music get far more modern credit for rock’s musical blueprint they really had very little to do with rock’s birth and don’t factor in much at all for half a decade or more. Jazz on the other hand was rock’s closest predecessor and with so many ex-jazz musicians making the move to rock, either moonlighting as sessionists or going all-in on the new style once it proved more commercially viable than what they’d left behind, the connection became unavoidable. Johnny Otis, though his every major musical accomplishment was rooted in rock ‘n’ roll, was at heart a child of the big band jazz era, cutting his teeth as a drummer in the swing bands that roamed the west playing to far-flung audiences in the sparsely populated plains throughout the 1940’s. When he settled in Los Angeles during the war years the shift in trends was already underway and within a few years he saw the musical climate gravitating towards something more streamlined, raw and untrained. In 1948 he opened his own club to highlight this exciting new music and began recording to capitalize on its rapid growth. But more than most who succeeded in this new realm Otis retained a jazz orthodoxy for a number of years, giving the records he was associated with a slightly different vibe than most rockers at the time. Here that’s very apparent, as the trumpets dominate the sound of Right Now Baby, which is usually the death knell for any rock song, at least until artists in the 60’s figured out how to alter the basic approach to modernize it. They don’t do so at all with this and when the saxophone, often the instrument expected to be the saving grace to outdated arrangements, comes in playing a mellow riff that doesn’t even hint at anything untoward going on under the surface you might be wondering why I even bothered reviewing a song that is residing on the rock/jazz border and leaning heavily towards the latter. Fair enough, but horns aside the structure of the rest of it is rather innovative for rock ‘n’ roll’s expanding palette. The percussion especially works wonders on the mood, giving it a slightly hypnotic feel that keeps grinding along as the horns stop and start in a reasonably alluring way. 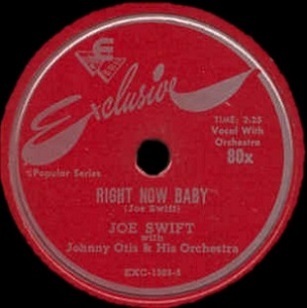 That contrast also sets off Swift’s vocals which employ a similar stop/start progression – not as clearly defined, nor as notable as on That’s Your Last Boogie, but more of a hesitation move, like a basketball player who is just about palming the ball in an apparently lazy moment before abruptly driving the lane and catching the defense off guard as he works his way to the hoop for an uncontested basket. The solo that follows is atrocious for rock, but amazingly it’s the reappearance of Swift, usually the weak point on all of his records, who rescues it from sliding further away from our sensibilities. As we keep saying Joe Swift the singer needs all the help he can get, his nasal baritone being so beyond redemption on its own that ANY trick to distract you from its clogged up tone is welcome. Here it comes largely from Swift’s pacing decision, that habit of feinting his intentions almost, making you pay attention to his technique more than his voice itself. But all of that trickery and subterfuge can only go so far to save a song beset by a below average singer unless WHAT is being sung has some redeeming qualities of its own and luckily Swift is proving to be a much better songwriter than vocalist. Right Now Baby uses the title phrase as a rejoinder to the various questions the girl he’s hitting on starts asking him once she shows that she’s indeed interested. It’s a different perspective, and a refreshing one at that, as usually the male protagonist in these situations (indeed, Joe Swift himself in previous incarnations) is an unwelcome presence in these girls lives, crass and insistent in their pitiful come-ons to whatever beauty catches their eye. In those cases the girl is forced to parry his advances, or duck into a crowded building (if not leap in front of a moving vehicle) to avoid him or else risk being cornered and possibly accosted by someone who’s so used to being a loser in the game of love that he becomes increasingly desperate in his attempts. On occasion the girl in question may actually turn out to be aroused by the guy’s interest but rarely do we get to see it play out with moderation on both sides. Boy sees girl, expresses his desire, she returns that interest with a measured response and off they go. You’d think that scenario would be offered up a little more often, after all it can’t be too soothing for the male ego if every time the singer opens his mouth to proposition a girl she’s reaching in her purse for mace. Since the guys are often the writers of the song, or at the very least the focal point of the record – and thus the record label’s ongoing attempt to market them as an appealing entertainer – it stands to reason that they’d be presented with a bit more tact and charm at times. But that’s rarely the case and so this provides a good opportunity to see if the guy in question is ill-suited for the role of a potential suitor of if he’s capable of surprising not only us, the listener, but also the girl of his desires. He doesn’t quite do that, as (maybe not surprisingly considering his lack of success in the past) Swift IS a little overeager in his replies, but he’s not blowing it either. His responses are suited for the context of the title line, as each time she asks when he wants to get together for various excursions together he anxiously replies “right now, baby!”. Yet he doesn’t do so in a crude demanding way, but rather one borne of excited impatience which is mildly endearing. You find yourself pulling for him in a way, hoping that he doesn’t scare her off with his exuberance, knowing he could, and probably will, do something inappropriate to sink his chances at any moment but hoping for his sake that he doesn’t. As a thematic device it may not sound too promising on paper but it actually works very effectively within the song as it wrests the control of the situation out of Swift’s hands, tempering his horniness by making him ever so slightly subservient to her willful compliance. Though better than expected and rather inventive at times I don’t want to make this out to be more than it is. As with every record he’s released to date Joe Swift’s vocal talents on Right Now Baby are something more to be overcome than to be celebrated. He manages to do so here but it takes a yeoman’s effort of everyone involved to mask his weaknesses enough to make this work to the degree it does. Otis even gives you a really nice echoed drum solo in the fade to get your mind on that rather than the foghorn vocals that preceded it. Yet despite my reservations about too heartily recommending Swift’s catalog as sides to eagerly seek out to hear the best rock has to offer at the time I find I’m never less than intrigued by him when I do encounter his records. The overall results are more often than not usually fairly good in spite of his own efforts, even, as is the case here, when weighing those compromised attributes against one another it’s seems as if it’ll be barely enough to get by. But like watching an ant dig his way out of the sand you cruelly piled on him at the beach or on a sidewalk just for your own amusement when you were a kid, you wind up being rather impressed when he works his way free of those obstacles and seems undeterred by the ordeal. We know now that Joe Swift is never going to be a star, never going to be a noteworthy influence, and almost certainly is never going to surpass that rather stunning debut, but he’s always going to keep trying, keep burrowing up through the sand he finds himself buried under, determined somehow to see the sky. In the end you have to admire someone like that. This may be only average, but with Swift it’s not the destination that’s impressive so much as it is the mileage it took to get even to that point. Leave a reply on "Joe Swift: “Right Now Baby”"